The Sleep of Reason Produces Monsters (Spanish: El sueño de la razón produce monstruos) is an etching by the Spanish painter and printmaker Francisco Goya. Created between 1797 and 1799, it is the 43rd of 80 etchings making up the suite of satires Los Caprichos. 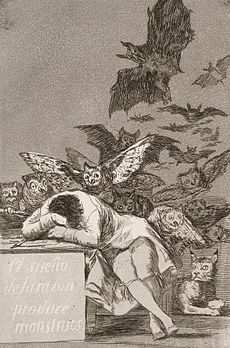 Goya imagines himself asleep amidst his drawing tools, his reason dulled by slumber and bedeviled by creatures that prowl in the dark. The work includes owls that may be symbols of folly and bats symbolizing ignorance. The artist's nightmare reflected his view of Spanish society, which he portrayed in the Caprichos as demented, corrupt, and ripe for ridicule. The work is held at the Metropolitan Museum of Art in New York and was the gift of M. Knoedler & Co. in 1918. The full epigraph for capricho No. 43 reads; "Fantasy abandoned by reason produces impossible monsters: united with her (reason), she (fantasy) is the mother of the arts and the origin of their marvels." The title of C. P. Snow's The Sleep of Reason, tenth book in his "Strangers and Brothers" series, and the Doctor Who novel The Sleep of Reason are drawn from this print. It also inspired the cover of the Andrew Miller novel Pure, as well as the 2017 album by Swedish metal band Meshuggah, entitled The Violent Sleep of Reason. Also the names of Finnish occult metal band Sleep of Monsters and their first album, Produces Reason derive from the name of the title. Occasionally the title phrase is rendered as "The dream of reason produces monsters", since the Spanish word "sueño" can mean either "sleep" or "dream". However, Goya's epigraph makes it clear that his intended interpretation is "the sleep of reason". ^ "Goya - The Sleep of Reason". Eeweems.com. Archived from the original on 2012-01-07. Retrieved 2012-01-04. ^ The Sleep of Reason Produces Monsters Johnson Museum of Art, Cornell University, 2013. Retrieved 11 May 2013. ^ The Metropolitan Museum of Art. "Francisco de Goya y Lucientes: The Sleep of Reason Produces Monsters: Plate 43 of The Caprices (Los Caprichos)". Retrieved 2008-12-14. ^ Jensen, Robin M.; Vrudny, Kimberly J. (2009). Visual Theology: Forming and Transforming the Community Through the Arts. Liturgical Press. p. 39. ISBN 978-0-814-65399-9. ^ "An elegiac ending to C. P. Snow's 11‐novel cycle". Retrieved 2017-12-16. Goya in the Metropolitan Museum of Art. New York: The Metropolitan Museum of Art. 1995. ISBN 9780870997525. Wikimedia Commons has media related to Capricho № 43: El sueño de la razón produce monstruos. Schaefer, Sarah C. Goya's The Sleep of Reason Produces Monsters. smARThistory. Khan Academy.